Easy to mount via grommet hole allowing for quick set-up. 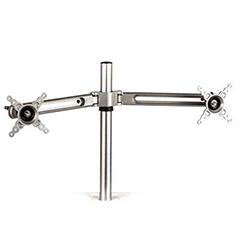 Height adjusts up to 16” above the top surface of the Lotus™ Sit-Stand Workstation with a reach of 12 ½”. Each arm holds a monitor up to 27” and 13 lbs. Meets VESA mounting standards.